Google+ opened it's doors to the public in September of 2011. According to Wikipedia, Google+ is now the second largest Social Media site. It surpassed Twitter in January 2013. By the end of 2012, Google+ had 500 million registered users, and on any given month it has 235 million active users (remember Twitter only has 200 million active monthly users). In recent months, I have found myself visiting Google+ more frequently than Facebook and Twitter for professional growth and learning. Google Apps for Education is spreading like wildfire throughout the education field and Google+ makes it very easy for educators to connect and network with others. Google+ provides it users with several tools that make connecting, sharing, and collaborating with others a breeze. Those tools are Circles, Communities, and Hangouts. Circles is Google's answer to organizing those you communicate with in Google+. When sharing content and posting in Google+, you may want to share a picture of your son with just your family members. This can be really simple by creating a "Family" circle and including just your family members in that circle. So when you are ready to post that picture of your son, you could choose to only share it with your "Family" circle. And you don't have to worry about it being shared with anyone else. Click to see my Circles. 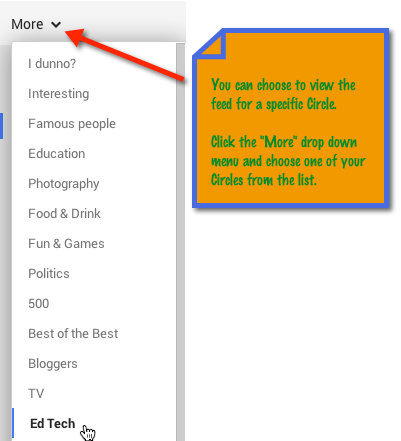 Circles are also great for filtering the content that you want to focus on. 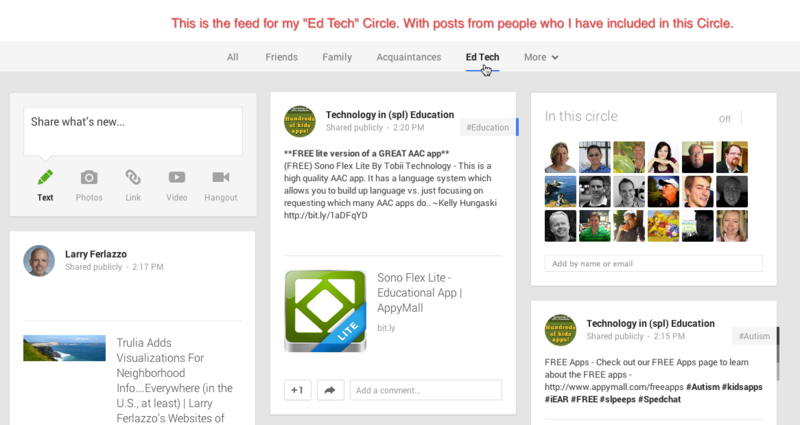 For example, if I want to see content that is focused on Ed Tech, then I could create a Circle called "Ed Tech" and include anyone on Google+ that is related to EdTech. I can view a feed of just that "Ed Tech" Circle. Circles are a great way to stay organized on Google+ and to make sure that you are sharing with the people that matter most. Think of communities like clubs with each having its own focus on a specific topic. Communities can be open to the public or they can be private and require an invitation. Communities have moderators that make sure that the content being posted is staying on topic. Communities also have categories to keep the content organized. There are TONS of communities, including a lot with an education and EdTech focus. You can search for communities by keyword. When you find a community you like, click on it and look for the red "Join Community" button. You can post content to communities, but make sure you stay on topic. You can also share someone else's post with a community. Communities are a great addition to your Professional Learning Network. Find a Community that interests you and your profession. Look for a community that has a lot of members. The more members that a Community has, the more active it is likely to be. If you find interesting Google+ users in a community, don't forget to add them to a Circle! Google+ Hangouts are probably the most powerful tool in Google+. Hangouts are video chats that you can hold with a group of other Google+ users. 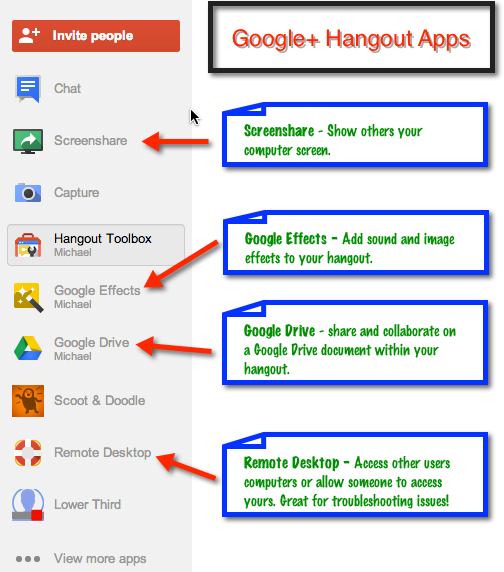 But Hangouts are much more than just video and audio. Hangouts have built in applications that allow you to do so much more than just talking to each other. Hangouts on Air is a great addition to Google+ Hangouts. This feature allows you to have a Live Hangout with an audience. You can video chat with certain Google+ users but also invite others to watch your Hangout. In a Hangout on Air, you can also have the Hangout recorded and shared to Youtube for others to watch later on. There are many people and organizations that produce Live Hangouts on Air and it's all FREE! One great example is Google Education on Air. This service has a LONG LIST of Presenters that offer FREE access to Live Google+ Hangouts on many subjects, airing almost daily! Friendly reminder: Use your Circles, Communities, and Hangouts to contribute and grow your PLN. It will empower you to learn and network!